You always hear you need to be consistent in what you do. and you need to keep doing this activity everyday. I know some people don’t believe that, it can’t make that big a difference. Well I can stand here in a raining Mississippi and say it absolutely does make a difference. For various reasons which I won’t get into here I haven’t written a blog article for a few months and my site has dropped in rankings from being ranked in the US in the top 60,000 websites to now in the Millions! Now who says activity doesn’t count? This is of course one little example, but if you create follows or fans and you only communicate with them once in a while what will happen. They may not even know you are there anymore or worse and more likely they are not going to follow you. So why aren’t people consistent? Can be many reasons and excuses, lack of organization, procrastination, that To-Do-List is to long, lack of time management, writers block, to busy. I could go on and on but you need to take action on what ever is stopping you. Create yourself a daily routine and stick to it. If you are going to blog, post on social media allocate a time to write the articles and then use a publishing calendar to make sure everything goes out when it should do. This will help drive consistency. 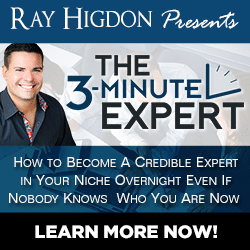 If you look at Ray Higdon, he publishes a Blog article everyday and has done for ages. Come, rain, shine, events, travel he gets his message out there everyday. It doesn’t need to be a long article, it can be video, audio on whatever you are happiest to use. Which obviously leads to what do I want to say or write about? Writer’s block is a phony, made up, BS excuse for not doing your work. Consistency is the Key to success, don’t find excuses. The same applies with Social Media, doesn’t matter what channels you are using if you don’t post regularly your account will become dead and eventually won’t get seen anybody. Although social media can be fun it’s important to remember that you have to work social media if you want it to work for you. Regardless if you are using Social Media for your business, your hobby or just sharing your musings it won’t get seen so get yourself into a routine and make sure you stick to it come rain or shine. You will reap the reward. If your motivation is purely the money it is probably not going to work. You need to find that True Passion that will really motivate you. When you find that passion it will allow you to produce and go that extra mile to get people enthused about what you do and become a fan. Once someone is a fan you make them into a raving fan and they will follow what you do and be an advocate for you. Then they will be coming to you which brings me back around to that whole attraction marketing concept. Attracting people to you for who you are, how you help people and what you stand for. Not for trying to sell them something or force something down their throat! If you are consistent every day, every week,every month you will become a master at your trade. Malcolm Gladwell in his book Outliers talked about needing 10,000 hours to be an expert in your profession regardless of that profession. So set yourself some meaningful goals, set yourself a schedule and publish content and create new connections every day and you will grow yourself and your brand. Let me know your thoughts and leave a comment. If you liked the article please share on your social media channels. What if you could be the Guru? How is your LinkedIn profile? Have you looked at it recently? Don’t worry you are not alone, only 42% of people update their LinkedIn profile regularly. So if haven’t done yours, you are in the majority! Here are some elements you should consider when you review your LinkedIn profile. The first part of your LinkedIn profile is the Business Card which shows at the top of your business profile. This has important items like your picture, your name and a brief description of your position or job. Make sure your profile picture is a professional picture. LinkedIn is a professional network and you want to look that way. Your professional headline is 110 characters long, make sure you use them all and make them count. You want to encourage visitors to find out more about you. Like any social media platform you need to be active on LinkedIn and share updates that are thoughtful and educational. Share insights and news on your industry. Your summary should build on your headline. It should convince the visitor they need to be talking to you. Make sure you have a good summary, key areas of expertise and keywords can also help your profile be found. Don’t neglect your endorsements, it can improve how you are found in searches. There have been over 10 Billion endorsements given since this feature was launched. The average is only 5 endorsements per user. This means you can easily stand out above the average. 81% of users belong to at least one group. There are more than 200 million conversations happening every minute on the platform. By being part of LinkedIn groups you will have the opportunity to take part in the discussions and use the group messaging features which helps you get more connections. Published by MarketMeSuite working with Maximize Social Business.com’s Neal Schaffer. How are you increasing your LinkedIn connections? What has been your most effective tactic? If you are new to LinkedIn what do you like best about the platform? Look forward to your insights and feedback on LinkedIn in the comments below.